Collins Booksellers - A Deadly Secret by Matt Birkbeck, 9781925324181. Buy this book online. The recent arrest in New Orleans and the HBO documentary The Jinx - scheduled to air on Fox in Australia in May - have put Robert Durst back in the headlines. 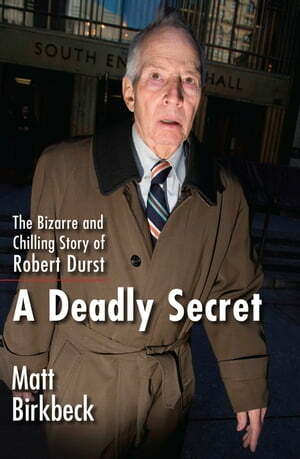 Here, from the first reporter to access Durst's NYPD files, is the authoritative account of a decades-long criminal odyssey-the very book found in Durst's own apartment when it was searched by police. When medical student Kathie Durst vanished in 1982, she was married to Robert Durst, son of a New York real estate magnate. Kathie's friends had reason to implicate her husband. They told police that Kathie lived in terror of Robert, and that she had uncovered incriminating financial evidence about him. But Durst's secrets went even deeper. For decades, Kathie's disappearance remained a mystery. Based on interviews with family, friends, and acquaintances of Durst, law enforcement, and others involved in the case, A Deadly Secret is a cross-country odyssey of stolen IDs and multiple identities that raises baffling questions about one of the country's most prominent families-and one of its most elusive suspected killers.